Uses : Piper longum or long papper is good for aromatic, stimulant, carminative ,constipation, gonorrhea, paralysis of the tongue, advised in diarrhea , cholera, scarlatina ,chronic malaria, viral hepatitis. Piper longum is most commonly used to treat respiratory infections such as stomachache, bronchitis, diseases of the spleen, cough, tumors, and asthma. When applied topically, it soothes and relieves muscular pains and inflammation. In ayurvedic medicine, it is said to be a good rejuvenator. Piper longum helps stimulate the appetite and it dispels gas from the intestines. 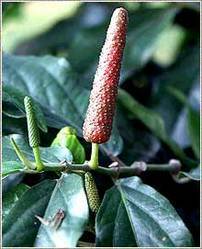 An infusion of piper longum root is used after birth to induce the expulsion of the placenta. It is used as sedative in insomnia and epilepsy. Also as cholagogue in obstruction of bile duct and gall bladder.